Are you looking to add beauty and value to your home, residential development or commercial property? Look no further than planting hedges, trees, shrubs and/or bushes into your landscape. Plantings look better and better as they continue to grow and they also improve privacy and property value too. Why Do You Want To Plant Hedges, Trees, or Shrubs? Do you want a new hedge for privacy? Are you trying to add interest to your garden beds? Do you want more seasonal color in your landscape? To get the most out of planting hedges, trees and shrubs on your property careful consideration is needed to select the right location, the right time to plant (early spring or fall), even down to the right type of plants for your property. Your land and soil conditions all help guide us to the right decision. Green Acres Lawn & Landscape is a licensed and insured Kansas City landscaping company that specializes in new plantings. We specialize in planting trees, shrubs and bushes on both residential and commercial properties. From planning out the proper varieties of trees to planting a privacy hedge, to a row of trees that line your driveway or property we’ll be able to ensure your new trees get off to a great start. If you want beautiful, healthy trees, shrubs, and bushes on your property then it’s important that care is taken during the planning and planting phase to ensure your new additions get a good healthy start. 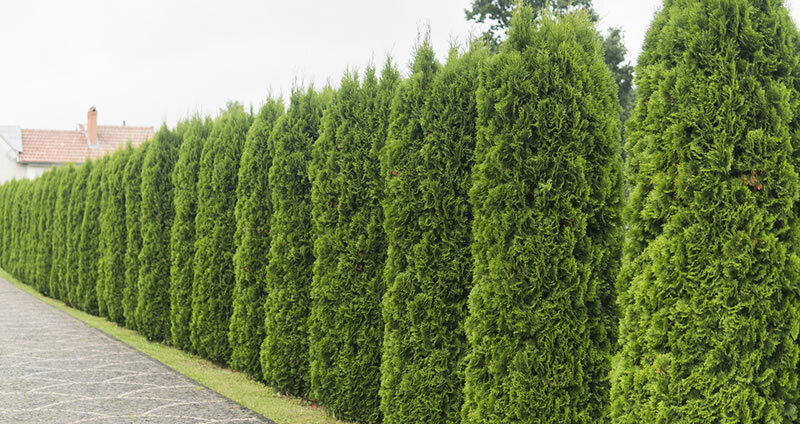 Whether you’re planting a large privacy hedge along the front or side of your property or you want to line your driveway or pathways with beautiful boxwoods, determining the right amount of trees to accomplish what you want can be tricky. Plant them too far apart and you’ll lose the desired affect for privacy or uniformity and if you plant too many too close to each other they won’t grow as large and healthy as they should. We can work with you to determine the right number of plantings depending on what you’re trying to accomplish and the particular species of tree, bush, or shrub you’ve chosen. Many homeowners think their soil will be perfect for the type of tree or shrub they want to plant and often it’s not. If the soil conditions on your property vary greatly from the soil in the root ball of your new trees the roots will have trouble taking to your soil. Soil density and soil PH play an important role in the health of trees, shrubs, and hedges. Clay or soils with lots of clay can be very hard and tough for roots to penetrate and will need to be amended by bringing in additional material. We’ll be able to quickly tell you the condition of your soil and what needs to be done with it for healthy growth of your new plantings. Planting trees, shrubs, or hedges on your property is an investment and if they are dead or dying from a lack of water they certainly won’t improve property values, if anything they will reduce the value and make the property look less attractive. It’s not uncommon for us to be called out to quote on replacing plantings that have died from a lack of watering. If you’re investing into a privacy hedge or several new trees or shrubs then an irrigation system will definitely add to the upfront costs but when your trees are mature and healthy you’ll forget about that because the increase in privacy and property value will have likely offset the cost. If you want nice, uniform looking hedges, trees, and shrubs then they’re going to need to be pruned at least once per year. There is much debate on when the best time to prune is but if you’re asking the professionals it’s best to do your pruning in the winter or early spring so the trees or shrubs have ample time to recover for the growing season. Don’t ever prune back more than 30% of the plant if you want to maintain it’s healthy growth. Pruning back too much will cause your trees, hedges, shrubs to go into a state of shock and will greatly diminish their growth rate, make them susceptible to pests or disease, or kill the them entirely. After your new plantings are in the ground you might want to consider adding some leaf or bark mulch to the beds to offer an insulating layer for your new plantings, especially going into winter their first year (if you planted them in the fall). Depending on your soil conditions it might be something you’ll need to address once or twice a year just to make sure the soil remains habitable. How Will Local By-Laws Affect Where I Can Place My Trees For A Privacy Hedge? They will is the short answer. Each municipality is a little different but in general you need to account for a small setback from your property line. This is to ensure you don’t encroach onto your neighbors property and you also have to consider how large your hedge might grow to. Planting a row of trees right on your property line is just asking for trouble, likewise planting the trees right along the boulevard in front of your home is too. We’ll be happy to discuss the local by-laws as they pertain to tree planting near property lines for your specific property. We’ve planted hundreds of trees and shrubs in the Kansas City Metro for our commercial and residential clients over the years. It’s the initial species selection and the care and meticulous prep work we do that contributes to the beautiful results we’re able to achieve with our clients trees and shrubs. The end result is healthy trees and shrubs on your property. The final cost of your trees will be determined by the species you’ve chosen, how many of them and what size they are. We’ll also need to consider the site they’ll planted and how much labour will be required. We’ll only be able to provide you with an accurate estimate for planting and maintaining your trees and shrubs after a thorough site inspection. If you’d like to schedule an estimate for planting trees, hedges, shrubs, or bushes on your property please give us a call (913) 422-5111 or fill out our online form and we’ll get right back to you.